Worldwide there are about 85 species of krill, the largest of which is the Antarctic krill (Euphausia superba) which averages about five centimeters in length. Antarctic krill live in dense concentrations in the cold Southern Ocean. At any given time there are four or five billion individuals, and when they congregate for spawning they create a pink swarm so large that it can be seen from space. Krill are crustaceans like crabs, shrimp and lobsters. 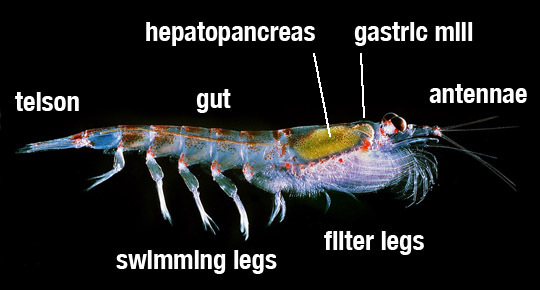 But unlike their cousins that are bottom-feeders, krill are pelagic—they make their living in the open ocean. And unlike the plankton they feed on, krill are nektonic—they are able to swim independent of the ocean currents. 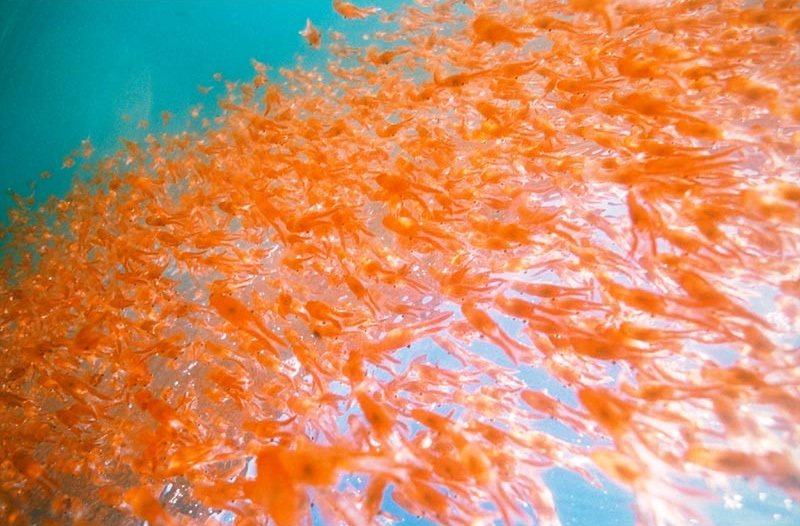 Antarctic krill feed on algae and phytoplankton that are suspended in the water column. They are preyed upon by nearly every Antarctic predator that exists. And if a predator doesn't eat krill, it feeds on the ones that do. A penguin's diet consists of nearly 100 percent krill. Blue whales rely on krill for almost all of their dietary requirement. During the summer months, an adult blue whale eats up to 40 million krill in a single day to fulfill its 1.5 million kilocalorie nutritional needs. Antarctic krill is the keystone species in the Southern Ocean, and without it, the ecosystem would collapse. Antarctic krill use intensive searching and rapid feeding techniques to take advantage of high plankton concentrations. 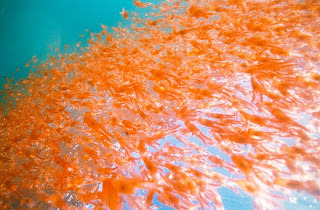 Krill form dense schools that move horizontally in the water column when feeding. Krill spend their days avoiding predators in the cold depths of the Southern Ocean. At night, they drift up toward the surface to search for phytoplankton. 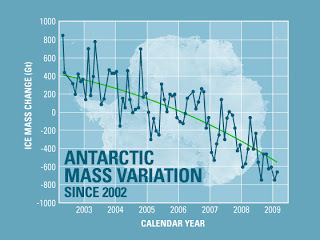 Recent studies show Antarctic krill stocks have dropped by as much as 80 percent since the 1970s. Scientists attribute this decline in part to ice cover loss caused by global warming. This ice loss removes ice algae from the Southern Ocean which is a primary source of food for krill. 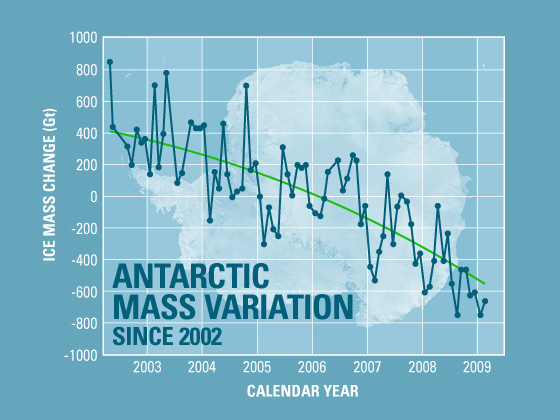 NASA satellite data reveals that there has been continuous ice loss from Antarctica since 2002—more than 100 cubic kilometers of ice per year. hi. thanks for sharing such a wonderful post. do keep u sharing more such updates.